An out of tune tenor sax announces another typically “little label” production from VRC out of New Jersey. Like Judy McDonald the female backing group is the Mellowettes and like Judy Willie Jones can really holler. The way he cuts loose from the second bridge onwards really makes this a disc well worth checking out. He even subdues the sax. Sadly I guess When Will I Stop Lovin' You must be the only 45 that he cut. 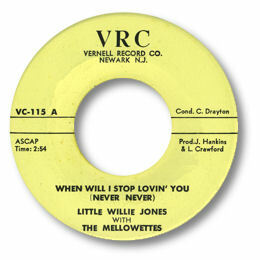 The song is a variant of Johnnie Taylor's "Never Never" (SAR 131) from 1962 so I assume this disc was a bit later than that.